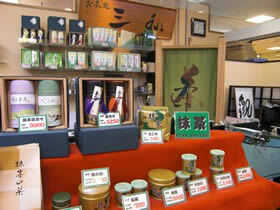 We are a retailer and a wholesaler of Japanese tea, and our shop is located in Kobe, Japan. Our Japanese green tea is guaranteed to be of high quality. Of course we have a lot of Japanese tea leaves and tea gift sets and tea confectionerys. Our Matcha Cookie are also available at the following stores. Now located in the Central Building in Terminal 1, Sakura Japanese Souvenir Shop offers a wide range of Japanese confectionary, tea and folk craft, including award winners in the Best Japanese Souvenir held in fiscal 2005 by the Ministry of Land, Infrastructure and Transport and the Visit Japan Campaign headquarters. Japanese confectionery, food, folk craft, etc. These stores have the traditional Japanese look and feature prize-winning items from the Visit Japan Souvenir Contest, hosted by the Ministry of Land, Infrastructure and Transport and the Visit Japan Campaign Headquarters. You will be able to get some souvenir of Kansai area in Japan(Nagoya, Ise, Mie, Kyoto, Osaka and Kobe). Our Matcha Cookie is in a package with green tea.